Strickholm and his CC friends were involved with the Celtic music revival of the late 70s during their last two years at CC. Upon returning to his hometown of Bloomington, Ind., which has a strong Irish and traditional music heritage, Strickholm began experimenting with fusing contemporary jazz and traditional Irish tunes with a classical music flair. The result? 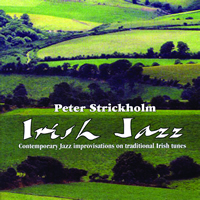 Recordings which sat for 20 years, until Strickholm had two Irish musicians master the best of the recordings onto a CD produced and published by the Strickholm family. Alumni who have written or edited books or recorded CDs are invited to send notifications to bulletin@coloradocollege.edu and bookstore@coloradocollege.edu or to mail a copy to Bulletin, 14 E. Cache La Poudre St., Colorado Springs, CO 80903. All submitted materials will be donated to Tutt Library; inscriptions inside books always welcome.